The University of Ulster is to host Northern Ireland's first qualifying event for the London 2012 Paralympics. The 2011 CPISRA Boccia World Cup, which was launched today [Wednesday] at Stormont, will be held at the University’s Jordanstown campus from 18-27 August, with over 400 competitors and coaches from across the globe coming to the pre-games qualifier. Boccia is a target ball sport from the same family as bowls and is a Paralympic sport for athletes with disabilities affecting motor skills. 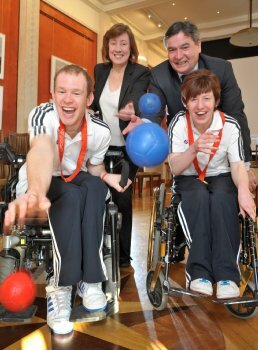 University of Ulster Vice-Chancellor, Professor Richard Barnett, said: “As Ireland’s leading University for sport we are delighted to be hosting the 2011 Boccia World Cup. The multi-million pound sports facilities at the Jordanstown campus will stage the CPISRA (Cerebral Palsy International Sport and Recreation Association) World Cup with the successful bid from the University of Ulster-Disability NI, backed by GB Boccia Federation, fending off competition from as far afield as the USA. The sporting venue has already played host to the 2009 Junior and Cadet World Fencing Championships and a host of international sports teams as a training venue, including the Italian national rugby team, Northern Ireland soccer team, and the Northern Ireland Commonwealth Games boxing team. Joined by Boccia athletes in the Long Gallery at Parliament Buildings today, the Sports Minister Nelson McCausland highlighted that with under 500 days to go until the London 2012 Olympic and Paralympic Games, today’s announcement is the first of many his Department is expecting to make, showing that Northern Ireland is playing a significant role in London 2012. He said: “Through this competition, from 18 - 27 of August this year, over 500 competitors and coaches, from over 30 countries will be in Northern Ireland to compete for qualifying positions in the 2012 Paralympic Games. My Department, through Sport Northern Ireland has been working with governing bodies of sport and local Councils for some time, targeting teams and athletes to visit Northern Ireland for events and training in the run-up to 2012. Many of those discussions are now bearing fruit, such as the Boccia World Cup. “This summer we hope to announce a sailing event for Olympic teams and a further programme of Paralympic events. We are in discussions with several Olympic and Paralympic teams with an outlook to train here in Northern Ireland next year as part of their preparation for 2012, and details of these will be announced once necessary paperwork is completed."